A seminal production - the first accurate map of the Caspian Sea. Carte Marine de la Mer Caspiene. A seminal production, this is Guillaume Delisle's 1721 map of the Caspian Sea according to the surveys of Van Verden and S. I Soimonov. It is the first printed map of the Caspian Sea based upon actual survey work. Although other cartographers also copied the work of Van Verden and Soimonov, Delisle was the first, and his mapping is the finest and truest to the original manuscript. Around 1718 Russian Tzar Peter the Great, sponsored a number of cartographic expeditions to the farthest reaches of his vast empire. One such was a command to map the Caspian Sea given to Dutch navigator Carl Van Verden. Though well known since antiquity, the world's largest lake was largely ignored by surveyors until Van Verden's work in the early 18th century. Van Verden's work was the most advanced mapping of the Caspian Sea to date, offering a new perspective on the region and opening the navigational possibility of the world's largest lake. In 1721 Peter presented the Paris Academie Royale des Sciences with a copy of S. I. Soimonov and Carl Vanverden's map of the Caspian region. 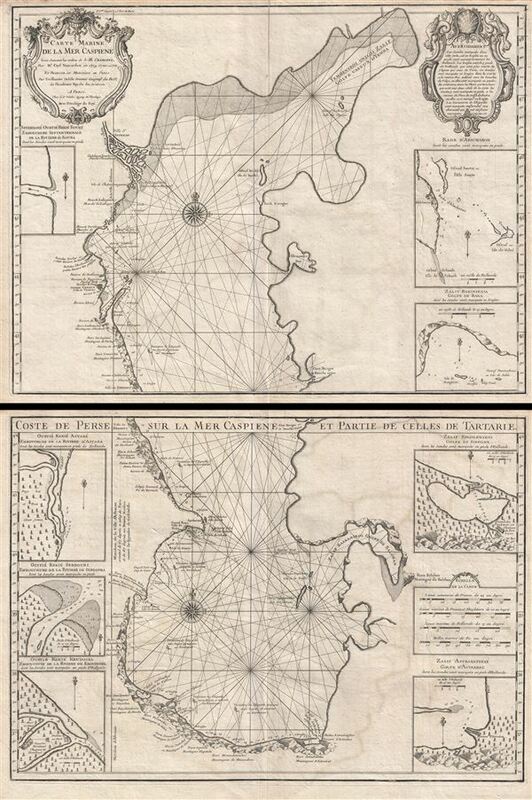 Without further delay, Delisle redrew the map (with great care), translated the inscriptions into French and printed it on separate sheets in reduced size in the Travaux of the Academy. He also included the map in his Atlas. In this way, the exact outline of the Caspian Sea, drawn on the Russian map of 1720, first appeared in a map prepared in western Europe. In 1723, G. Delisle returned anew to the map of Verden and Soimonov and transposed from it the correct outline of 'Caspia' to the map which he was preparing. This can be seen by the outline of Verden and Soimonov on their map of 1720. This point is confirmed by the caption on the map of 1723 which describes it as 'dressee pour l'usage du Roi (Louis XIV) sur la carte de cette mer faite par l'ordre du Czar (Peter I).' The fact that Delisle used a map with Russian names becomes clear from the inscriptions on the map of 1723. 'Dua Brata ou Les Deux Freres,''Ostrov Giloi-Isle Habite,' 'Ostrov Svinoi ou Isle des Cochons,' 'Krasnie Vodi ou Les Eaux Rouges,' and others. The map proper is surrounded by eight inset maps detail various gulfs, bays, ports, and rivers. The upper sheet has two large cartouches, the left bearing the title and dedication to Van Verden and the right a description of the map. The right hand cartouche also features two dragons. This map was originally prepare for publication in the Academie Royale des Sciences journal Bibliographie Generale des Travaus Historiques, but it was also simultaneously issued independently and in various Delisle atlases. The De L'Isle family (fl. c. 1700 - c. 1760) (also written Delisle) were, in composite, a mapmaking tour de force who redefined early 18th century European cartography. Claude De L'Isle (1644 -1720), the family patriarch, was Paris based a historian and geographer under Nicholas Sanson. De L'Isle and his sons were proponents of the school of "positive geography" and were definitive figures, defining the heights of the Golden Age of French Cartography. Of his twelve sons, four, Guillaume (1675- 1726), Simon Claude (1675 - 1726), Joseph Nicholas (1688 - 1768) and Louis (1720 - 1745), made a significant contributions to cartography. Without a doubt Guillaume was the most remarkable member of the family. It is said that Guillaume's skill as a cartographer was so prodigious that he drew his first map at just nine years of age. He was tutored by J. D. Cassini in astronomy, science, mathematics and cartography. By applying these diverse disciplines to the vast stores of information provided by 18th century navigators, Guillaume created the technique that came to be known as "scientific cartography", essentially an extension of Sanson's "positive geography". This revolutionary approach transformed the field of cartography and created a more accurate picture of the world. Among Guillaume's many firsts are the first naming of Texas, the first correct map of the Mississippi, the final rejection of the insular California fallacy, and the first identification of the correct longitudes of America. Stylistically De L'Isle also initiated important changes to the medium, eschewing the flamboyant Dutch style of the previous century in favor of a highly detailed yet still decorative approach that yielded map both beautiful and informative. Guillaume was elected to the French Academie Royale des Sciences at 27. Later, in 1718, he was also appointed "Premier Geographe du Roi", an office created especially for him. De L'Isle personally financed the publication of most of his maps, hoping to make heavy royalties on their sales. Unfortunately he met an untimely death in 1728, leaving considerable debt and an impoverished child and widow. De L'Isle's publishing firm was taken over by his assistant, Phillipe Buache who became, posthumously, his son in law. The other De L'Isle brothers, Joseph Nicholas and Louis De L'Isle, were employed in the Service of Peter the Great of Russia as astronomers and surveyors. They are responsible for cataloguing and compiling the data obtained from Russian expeditions in the Pacific and along the northwest coast of America, including the seminal explorations of Vitus Bering and Aleksei Chirikov. The De L'Isles, like their rivals the Vaugondys , must be considered speculative geographers. Speculative geography was a genre of mapmaking that evolved in Europe, particularly Paris, in the middle to late 18th century. Cartographers in this genre would fill in unknown areas on their maps with speculations based upon their vast knowledge of cartography, personal geographical theories, and often dubious primary source material gathered by explorers and navigators. This approach, which attempted to use the known to validate the unknown, naturally engendered many rivalries. The era of speculatively cartography effectively ended with the late 18th century explorations of Captain Cook, Jean Francois de Galaup de La Perouse, and George Vancouver. Carl Van Verden (fl. c. 1718 - 1730) was a Dutch seaman in the employ of the Russian Navy during the early 18th century. Van Verden is best known for his important 1719 - 1721 mapping of the Caspian Sea, which was the most sophisticated and accurate that had been issued to date. A significant cartographic achievement, Van Verden's work on the Caspian led directly to Peter the Great's 1722 invasion of Baku and Derbent and Russian hegemony in the region. Despite his achievements in the Caspian, Van Verden was later passed up by the Tzar in favor of Vitus Behring for the commission to discover a Northeast Passage through the Russian Arctic. Very good. Original centerfold. Wide margins. Blank on verso. Platemark visible. Stated size represents two panels. Rumsey 4764.082, 4764.081, 4764.083. Allen, W. E. D., 'The sources for G. Delisle's 'Carte de Pays Voisin de la Mer Caspienne'of 1723', Imago Mundi, Vol. 13 (1956), pp. 137 - 150.